Death Mark, subtitled The Dread of this Desolation, written by Robert J. Schwalb. TSR and later Wizards of the Coast have seen great success (and at times great failures) through their novel lines. For an excellent historical look at novels, I highly recommend Designers & Dragons, A History of the Roleplaying Game Industry, by Shannon Appelcline. Other novels were released as well, though never as popular. The Tribe of One series was popular, as was The Rise and Fall of a Dragon King, though all the novels seemed to deviate from canon (sometimes horribly) and writing quality varied greatly. Still, every series has provided some depth to the world and all can help a DM or player enjoy their time in Athas more greatly. With 4th Edition Dark Sun the Prism Pentad was re-released. In addition, two novels were released. City Under the Sand is a decent read. It has a number of canonical issues, though some can be argued (the central figure is a metal-smith, which matches some canon but not the spirit of the majority of the metal-poor setting’s canon). It does provide an interesting look at Nibenay and the idea of the buried city is compelling (even if various parts are hard to imagine playing out as depicted). Under the Crimson Sun is part of the Abyssal Plague novel series and suffers in many ways. While both novels have some of the worst editing I have seen in WotC novels, the later is alarmingly bad – at times disrupting the reader’s enjoyment every few pages. There are canonical issues, but also problems with the characters, the story, and the flow of the plot. My biggest grief as a fan of the setting is that the novels add little to the setting and miss the opportunity to reinforce what makes the setting so unique. When I heard about Death Mark I was both eager and concerned. Rob Schwalb is an incredible RPG writer, and his writing has strong narrative qualities. This guy is probably your hero, and certainly mine. But would this novel be better than the last two? Would it serve as a proper DM and player tool to help us better visualize and enjoy the setting? In a word, yes. I want to get out of the way what I didn’t like, and it is likely a personal thing. I’m not much into horror and I’m not into descriptions of gore. While it is probably very fitting for the setting to include graphic details in combat and other scenes, I found it over the top and even disgusting at times. People didn’t just die… they did so with some anatomically horrid detail I could have done without (eyeballs seemingly a favorite, but viscera are plentiful). I found it actually surprising – I wasn’t aware Wizards novels would contain that type of description. So, for me, this was a turn-off and it happened often. I didn’t find the book scary, just more gore than I prefer. I still read it all, and I suspect it won’t be a big issue for many gamers. Beyond that, there were few negatives. Yes, there is a small mistake about erdlu (they aren’t supposed to be ridden – that should be a crodlu) and 1-2 other issues, but they are incredibly minor. On the scale of Dark Sun novels, canon is extremely well handled. The novel’s characters do get a bit confusing at times, especially when two female members of different houses come together and then their friends that help define them either separate or join the other woman. The amount of undead at one point seemed without proper explanation. While Athas certainly has tons of undead, the number appearing just needed an explanation. Portals to the Dead Lands, ancient battle and the necromancer had a tome describing it, anything to explain it and not make it so jarring. That one major and other minor bits aside, this is an excellent novel. I highly recommend it for any Dark Sun fan, and for fans of this type of fiction as well. The story is really very good. The characters are well developed, they have interesting goals and motives, they are dynamic, and they interact in cool ways. The novel has many surprises, especially around how the characters come together and the choices they make – this is not a novel where you guess the ending (or even the middle) and that is a strong positive. The conclusion is both interesting and fitting for the story. The novel features several major merchant houses, an aspect of the game that is detailed in the AD&D sourcebook Dune Trader, but which sees only broad high-level treatment in the 4th edition Dark Sun Campaign Setting book. Death Mark does a lot to help us visualize the major houses Stel of Urik, Vordon of Tyr, and decadent House Shom. The novel does a great job of showing how these houses compete and how they market goods in a place such as Tyr. The treatment is sufficient for any DM to come up with several ideas around a merchant-centric campaign, and the characters in the novel make great NPCs (foes, allies, or both). The Dark Sun setting turns traditional D&D races/species upside down. Elves are thieves, dwarves are beardless, and new races like muls and half-giants make the setting very different from traditional D&D. 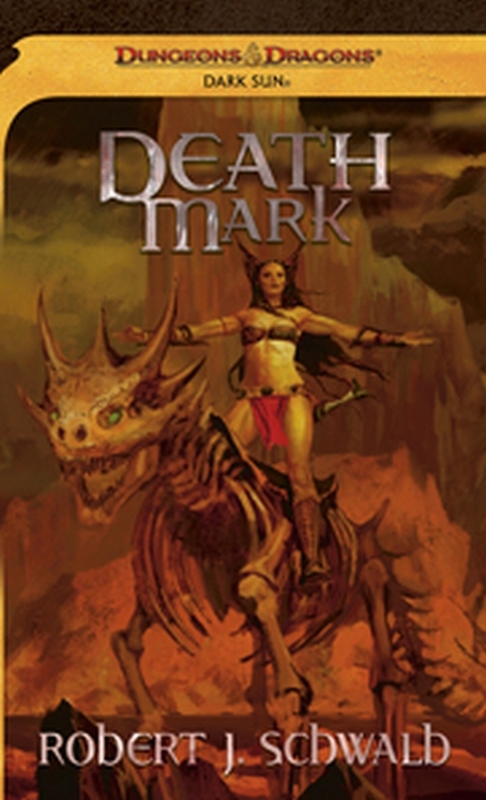 Death Mark does a great job of portraying Dark Sun halflings, mul, half-giants, and especially dwarves. The character of Pakka is a traditional AD&D-style dwarf, with her focus a compelling central part of her personality. This is very useful for any Dark Sun fan and a lot of fun to read. In the interview on Athas.org (see link below), Rob provides an unofficial idea on how to weave a Dwarven focus into the game! 4E stripped away some of the old AD&D emphasis on elemental priests. This novel brings it back in an excellent way. Pakka is much more of an AD&D elemental cleric than she is a 4E shaman. She brings back great memories of the sun clerics in the Pentad and really helps gamers get a feel for how primal/elemental forces can be wondrous, desirable, and feared on Athas. In contrast to how I felt about gore, I loved the tension in the novel. Friends can become foes and the other way around. Action is brutal and fast and furious, and everyone seems destined to die. Nothing is safe and from start to finish every character is struggling against a world that seems devoid of hope. Characters don’t ever seem to win – except by surviving. That depiction is fantastic for the setting and invaluable to gamers as a reminder of how to portray Athas. A mixed bag. I thought the novel did a great job of reminding us how undead can play a role in the setting, through Under-Tyr or necromancers. But, I thought it could have done a better job of highlighting Athasian undead from old books rather than zombies and ghouls and Far-Realm variants. The novel is invaluable for getting a feel for a Tyrian-based campaign. From details of Shadow Square to the Golden Tower to Caravan Way and more, the novel really does a great job of making Tyr a robust and interesting part of the campaign setting. Numerous details are worth integrating into actual play, such as Torston’s gang (which I already used! ), the idea of what Tithian is doing with the iron mines, Under-Tyr locations and Yuan-Ti, various establishments, and more. Other locations, especially Silver Spring but also the mountains and rocky badlands near Tyr, see some valuable attention. The novel’s focus on the war with Urik, and the way 4E reset the setting back to just after the fall of Kalak, all suggested this novel would conflict with book 2 of the Prism Pentad, The Crimson Legion. However, Rob cleverly weaves a tale that works with both visions. This is fantastic, because DMs can take the best aspects of the Pentad and still gain utility (without conflict) with Death Mark. This makes it much more valuable for any DMs that want to lead up to a possible war between Urik and Tyr. In fact, much of the novel’s plot is useful as a campaign premise and does so better than the AD&D adventures that tried to mirror the Pentad. This was an excellent read and deserves to be placed on the shelf next to the Pentad. Whether to insert it between The Verdant Passage and The Crimson Legion is a good topic for discussion, but it certainly deserves to be in every Dark Sun fan’s collection. Where the previous two Dark Sun novels failed, this novel succeeds. It is a valuable resource for DMs both for helping to visualize the world but also as a source of campaign ideas. More importantly, it is a fun and well-written (and well-edited) book. Review of Designers & Dragons and link to pdf or print purchase for the new version. You can find older AD&D era Dark Sun novels for about $1 on Amazon or similar sites – but consider checking your local used bookstore. This entry was posted on October 12, 2015 by Alphastream and tagged Novels.